This is the second in a series of occasional blogs describing the Industrial Internet Consortium (IIC). The first entry described the goals, membership, and provided a broad outline of its work. This second entry describes the engineering work taking place. “The Technology Working Group will define and develop common architectures by selecting from standards available to all from open, neutral, international consensus organizations and reviewing relevant technologies that comprise the ecosystems that will make the Industrial Internet work. To accomplish these goals, several Task Groups have been established as described below. 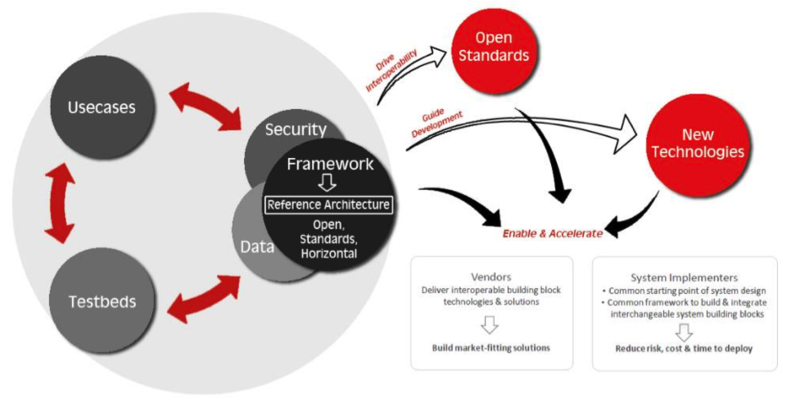 The Architecture Task Group has built a Technical Report that documents an open, standard-based Industrial Internet Reference Architecture (II RA) with specific consideration to key capabilities and system characteristics, including resilience, safety, and security. The II RA is available now. The audience for the Technical Report includes technology and solution providers who can use it as a tool to guide the development of interoperable technologies and solutions based on open standards with the assurance of meeting resilience, safety, and security requirements. It can also be used by system implementers as a common starting point for system conception and design. The II RA can be used to build and select interchangeable technologies and solutions to appropriately address operational risks and reduce developmental costs and time to deployment. The Technical Report thus aims to create a broad industry consensus around Industrial Internet system architectures and development approaches that can help drive product interoperability and the deployment of systems appropriate for their intended uses. Any identification of technology, practices, and standards gaps in the process will help motivate the industry to address these technical deficiencies in a collaborative and timely manner. The Vocabulary Task Group is engaged in ongoing activity. Its work is embedded throughout the IIC teams as new terms are identified and defined. Terms used in the II RA have been defined and released as a companion document. The Use Cases Task Group gathers use cases. As it does so, it is reconciling each use case against the reference architecture, which means extending each use case to identify required technology. For example, a use case may have a particular technology requirement for data storage, volume, or usage; communications latency, throughput, and reliability; resiliency and reliability; performance; or security, trust and privacy. Each of these technological requirements drives elements of the reference architecture. Accordingly, the use case “template” (an outline for each use case that is reused each time to ensure completeness and consistency) has been extended to incorporate these technological requirements. This task group is working to provide an in-depth description of data management functionality in Industrial Internet systems. The resulting document will be an extension to the Data Management section found in the Architecture team’s II RA. This task group is working to provide an in-depth description of analytics and advanced data processing in Industrial Internet systems. It will build an Industrial Internet Analytics Framework Technical Report that identifies industrial analytics architecture concerns and forces that determine the reference architecture(s); catalog existing methodologies, architectures, algorithms, and engineering and operational practices; and survey and catalog the existing analytics standards and best practices. This task group is developing an in-depth description of connectivity for Industrial Internet systems. The document will be an extension of the Connectivity section in the II RA document. The document will also address the interlock with other aspects of the II RA, in particular, the intersection with Distributed Data Management and Interoperability and Security. The document will also provide guidance to Testbeds for applying the connectivity reference architecture and the applicable standards. Taken together, the results of the last three groups’ work (Distributed Data Management and Interoperability, Industrial Analytics, and Connectivity) will form multiple extensions to the II RA, as shown in Figure 1. Figure 1: Collaboration within the Industrial Internet Consortium will lead to new standards and technologies. As can be seen from the above, there is a lot of work focused around providing input as a “cross-cutting concern” to the II RA Technical Report, and no more so than with Security. 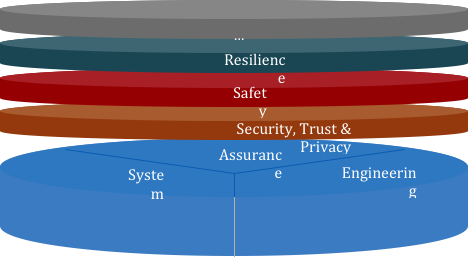 An initial General Security Use Case, started a year ago, suggested an outline for the organization of the security elements that need to be addressed by every single portion of the Reference Architecture, and the Security Working Group has been contributing continuously to the II RA Technical Report. However, that document provides only a broad overview of the architecture and security. Now, the Security Working Group is building a Security Framework that has the same structure as the II RA. This will ensure that security is not just bolted on to the architecture, but rather is a fundamental part of it. This document will elaborate on the contributions already made to the II RA, and take that work into more security-specific territory. This task group has also already contributed to the II RA, and is contributing sections to the Security Framework. In time, they will develop deliverables that address safety in different vertical markets. Other key system characteristics, such as resilience, reliability, scalability, usability, maintainability, portability, and composability must also be considered as shown below. We intend to address each as the interests and activities of IIC members dictate. Figure 2: The vertical areas that must be examined in the overall reference architecture framework. Stephen Mellor is Chief Technical Officer for the Industrial Internet Consortium.